Two brand new top-level pages in this release. The first, the artist overview, lists all artists in your collection. The second, the activity stream, is a more detailed form of the previous activity stream. Also, this release allows you to add your own genres to the 'allowed' list, rather than relying on the pre-defined list. Like the album overview you can vary the number of artists displayed. Page navigation works the same too, navigate left or right to see more artists. Press the browser refresh button or F5 to update the view when new artists are added. The artist overview is currently not updated live like the album overview, I could add that in if people request. Clicking on any one of the artist names shows you all the albums for that artist. Each entry in the activity page represents an assessment, and sometimes a fix, made by bliss. It also shows the cost in terms of fixes of each fix. I added detail as to where art is downloaded from an installed to, and where files are moved. If you have any further requests of what to show in the activity stream, please suggest it in the ideas forum. By popular demand you can now add genres to the 'allowed' list. The 'allowed' list is the set of all genres you permit within your music collection. The idea is, by constraining this set, you restrict the quantity of genres in your collection to avoid genre explosion and gives you a way to consolidate your genres. Albums in a genre not in the list are suggested an alternative which you can choose to apply or ignore on an album by album basis. Genres are added using the filter text box previously visible in the genre selector. 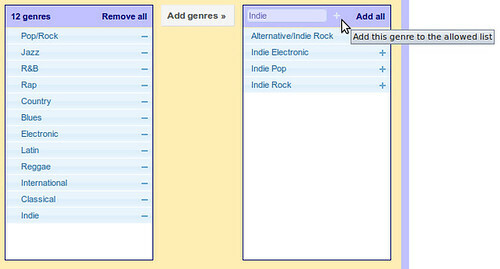 Type in your genre and click the '+' plus sign. Your genre appears in the allowed list. To save the list and re-assess your albums against the new list, press the 'Apply rules' button. That's quite a large release, but there's more! Get the new release from the downloads page. Your existing fixes will transfer.